Australia 7-168 (David Warner 59, Shane Watson 47, Saeed Ajmal 2-19) defeated Pakistan 74 (Nasir Jamshed 17, Yasir Arafat 15, Mitchell Starc 3-11. The Australian openers, David Warner and Shane Watson, showered sixes from their bats as Pakistan faced the heaviest defeat in the T20 by a margin of 94 runs. The Australian batsmen thrashed 12 sixes in the game while their bowlers exhibited a lethal bowling spell and crushed the solid looking Green Shirts batting. The Kangaroos hammered 168 runs for the loss of seven wickets at the end of their allocated quota of 20 overs and Pakistan was bowled out for 74 mere runs with five balls to spare. David Warner (Australia) was declared ‘Player of the match’ for his aggressive knock of 59 off just 34 balls. Saeed Ajmal (Pakistan) was declared ‘Player of the series’ since he grabbed 6 wickets in the series at a super average of 8.66 runs per wicket with the best of 2-13. The third and final Twenty20 of the series was played on Monday, September 10, 2012, at Dubai International Cricket Stadium. Earlier, Mohammad Hafeez, the skipper of Pakistan, won the toss and offered the batting to Australia. The innings was initiated by the experienced openers, David Warner and Shane Watson who scored 16 runs in the first three overs. Warner hit the first six of the innings in the fourth over and Watson followed him in the next over. Watson geared up in the 8th over by dispatching three grand sixes to Shoaib Malik and Warner treated Raza Hasan in the same brutal way in the following over. The first hundred of the innings was smashed in the 10th over with one six from each batsman and the second fifty was attained in just 15 balls. The Kangaroos openers posted the highest first wicket stand for their team by enhancing the total to 111 in 10.4 overs. Shane Watson was caught at this stage by Umar Gul at short fine leg off Yasir Arafat for 47 from 32 balls with 5 huge sixes and 1 four. David Warner became the next victim of Yasir Arafat after the addition of just three runs to the score at his individual feat of 59 from 34 deliveries with 6 lofty sixes and 1 four. Glenn Maxwell scored a quick fired 27 off 20 balls with 1 six and 3 fours as the Pakistani bowlers came back in the game by grasping few wickets. Saeed Ajmal became the highest wicket taker in T20 when he clean bowled the Australian captain, George Bailey, for three runs. That was the 59th wicket for Saeed Ajmal and he overtook his countryman, Shahid Afridi. The Australian middle order batsmen were unable to capitalise on the thundering opening partnership and ended up by scoring 168 runs with three wickets in hand. That was the highest T20 score by any team at Dubai International Cricket Stadium. Umar Gul, Yasir Arafat and Saeed Ajmal picked two wickets each whereas Raza Hasan claimed one. The Pakistani innings was opened by Mohammad Hafeez and Imran Nazir as six runs were scored from the first over. The Australian bowlers put the home batting back in their shells as the wickets started falling like ninepins. Imran Nazir was declared leg before wicket off Mitchell Starc in the second over for one mere run and that was the beginning of disaster for the Green Shirts. Pat Cummins struck twice in the next over by removing Mohammad Hafeez and Shoaib Malik. 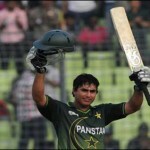 The hosts were reeling at 5-19 in 5.1 overs as Nasir Jamshed and Abdul Razzaq resisted for a while. They took the score to 36 in 9.2 overs when the first was gone for 17 off 23 balls with two fours. Abdul Razzaq was the other batsman who touched the double figures by scoring 13 runs as the entire team was bowled out for 74 runs in 19.1 overs. That was the lowest ever score by the Green Shirts in T20 internationals. Their previous lowest score was 89 against England on September 7, 2010, at Cardiff. Mitchell Starc and Pat Cummins were the top wicket takers with three wickets each whereas Shane Watson, Brad Hogg and Glenn Maxwell shared one wicket each. Australia came back strongly in the last game and beat Pakistan by a big margin of 94 runs, however, they lost the three match series 1-2.